Крыши Челябинска >>> в коллекцию крыш. Is that photo beautiful to you, Zhenya? 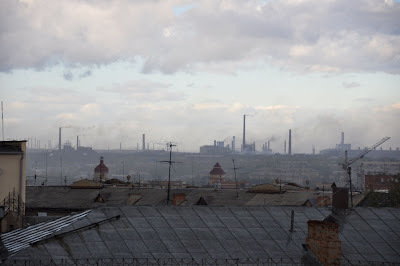 Chelyabinsk is obviously a gritty, industrialized city that makes me think of the old Soviet Union, but I can certainly understand how one might find the beauty in it, especially if it's your home. One thing I've learned over the years is never to disparage someone's home. It's important to respect a person's home. Important safety tip, though. Not many landing places if you lose your thermal!!!! Fly around the city, not directly over it. Ha! I like my city, yes, but I don't like how this industrial zone looks like, really.